A new start-up aims to offer a solution to the problem of foreign tech entrepreneurs wanting to work in Silicon Valley but being ineligible for US visas. 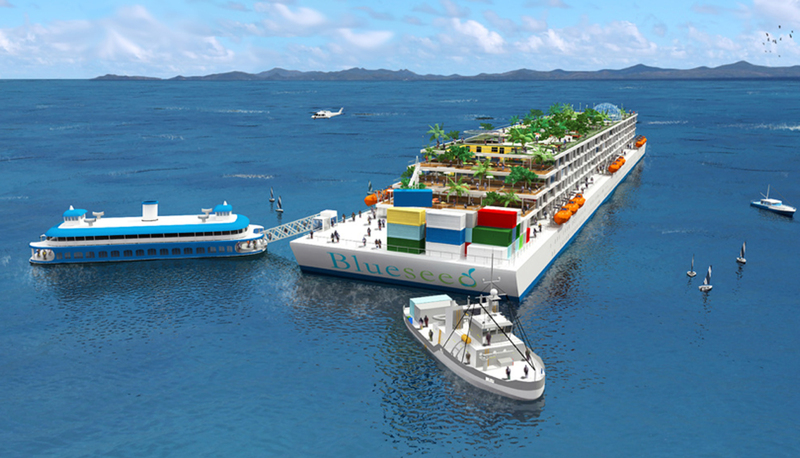 Blueseed hopes to build an island-ship, to be docked 12 miles from the Californian coast, with the geeks onboard regularly being ferried to the mainland. It’s not the first time a project of this kind has been attempted, but this one might actually become a reality. By REBECCA DAVIS. The idea of a floating utopia, free from governmental meddling, has long been a libertarian dream. The motivations driving these kinds of projects have historically been varied: in addition to the political agenda, a floating base could be the ideal site for a tax haven, or a location for activities on the outskirts of legality, like gambling, prostitution or the broadcast of pirate radio stations. Under current law, countries have territorial claim up until 12 nautical miles from shore. Beyond that, the area extending to 200 nautical miles is an “exclusive economic zone”, which means that all exploitation of natural resources is the sole province of the controlling country, but it allows for vessels or other structures to be stationed there. In the past, attempts to establish some kind of offshore micro-nation have fallen into two categories: those which use ships, oil rigs and the like; and those which attempt to build up land on existing geographical features like reefs. In the 1960s, the notion gained momentum and took on additional urgency for Americans hoping to dodge the draft and avoid being sent to Vietnam (and for whom Canada was an unattractive prospect). In the latter part of that decade US cosmetic mogul Werner Stiefel spent years on planning “Operation Atlantis”, which was to be an independent colony for hardline free marketeers. Stiefel’s original plan was to create an artificial island as close to the US as laws would allow. He realised this dream was impracticable after the case of Louis M. Ray, a developer who in 1969 was barred from building a new country on top of coral reefs off the coast of Florida. Stiefel interpreted the judge’s decision in this matter to mean that “Uncle Sam will tolerate no new offshore nation which utilises existing reefs or other natural structures,” as he wrote in his newsletter, the Atlantis News, at the time. So he changed tack and had a 38-foot boat built out of cement. The Atlantis II, as the vessel was named, was launched down the Hudson River in December 1971. It capsized almost immediately, because in order to make it fit for purpose, the ship had features like a concrete deckhouse, which made it top-heavy. This setback didn’t deter the indefatigable Stiefel. He switched his attention to an area in the Caribbean called Silver Shoals, which was claimed by both Haiti and the Bahamas, and began to carry out landfill operations with an eye to creating an island. Alas, it was not to be – Haitian president Francois “Papa Doc” Duvalier sent in his gunboats and ran Stiefel out of the area. Wired magazine reports that Stiefel had one further shot at his dream when he bought an oil rig and attempted to anchor it between Cuba and Honduras, but a storm destroyed it. There have been other Stiefels in the last century. Another radical libertarian millionaire, Michael Oliver, created the Republic of Minerva in 1971 by loading sand on to the Minerva Reefs in the Pacific Ocean. It’s likely that nobody would even have noticed, except that on 19 January 1972 the Republic of Minerva sent letters to neighbouring countries announcing their declaration of independence. Tonga decided that it was pretty sure the reefs belonged to the island kingdom, a claim which was backed by Australia and New Zealand, and Tongan King Taufa’ahau Tupou IV promptly sent an expedition to tell the Minervans to get packing. A decade later, another group of Americans tried to conquer Minerva, but Tongan troops again disposed of them. Then there’s the Principality of Sealand, located on a former World War II fort, 7 nautical miles off the coast of the UK. When it was formed in 1967, law held that the UK’s territorial waters only extended to three miles. In 1987 this was extended to 12, so Sealand now sits within UK territory. This doesn’t stop Roy Bates (or “Prince Roy”, as he styles himself) declaring Sealand the world’s smallest independent sovereign state. Sealand has its own flag, currency and passports, and the results of a 2007 census found the total population to be 27 people, with an impressive unemployment and poverty rate of 0%. Sealand is not officially recognised by any other state. It continued: “Using this futuristic concept we can break the chains which bind us to land, together with the chains that bind us to the system of the government which has become perhaps irreversibly entangled in bureaucracy, corruption, and the free lunch philosophy. Forget the old fashioned idea of leasing land from another country, let us create our ‘land’ instead. In our new country, Oceania, we can practise genuine free enterprise, enjoying true freedom in the tradition envisioned by Von Mises, Hayek, and Rand.” By 1994, the project had been shelved due to lack of interest. More recently, in 2008, PayPal co-founder Peter Thiel invested in “the Seasteading Institute”, an NGO run by economist Milton Friedman’s grandson, Patri, which aims to explore the ways in which floating settlements can be made a reality. Wired reported in 2009 that Thiel (yet another arch-libertarian) said at the time: “Decades from now, those looking back at the start of the century will understand that seasteading was an obvious step toward encouraging the development of more efficient, practical public-sector models around the world”. The Blueseed team, which includes a former Yahoo engineer, hopes to attract “the boldest, brightest, and most talented tech entrepreneurs from around the world” – who despite their boldness, brightness and talent cannot get their hands on a US work visa – to come and live on the yet-to-be-built Blueseed vessel, which they say will likely be an old cruise ship they’ll revamp. Your monthly rent on the ship will range from $1,200 for a shared cabin to $3,000 for a “top-tier single accommodation cabin”. There will also be bars, cafes and a gym, as well as – crucially – high speed internet access. Because the ship will be in international waters, you’ll be legally allowed to work while on board. The idea is that you make regular trips to the US mainland using a business or tourist visa. Blueseed will be providing daily shuttle ferries, and foresees the total trip taking about 90 minutes, which they suggest is a pretty good commute for San Francisco. In terms of taxation, Blueseed residents will have to pay tax to the country in which the ship is registered (most likely the Bahamas, where most cruise ships are registered). On board, either English or American common law will be followed. Naysayers have suggested it would be far from ideal to have a working environment that is perpetually rocking. The Blueseed team dismisses this concern, though not entirely convincingly: “Stability analysis conducted on a narrower and shorter vessel in an ocean spot with 50% bigger waves has shown that stability is within acceptable limits for European passenger ferries.” They also point out that these days, sea-sickness medication is inexpensive and effective. Blueseed also scoffs at the notion that piracy might be a fear: “They don’t exist near California to begin with, (and) they have much better targets (cargo ships, for instance, with little personnel and a lot of cargo already packaged for resale)”. This may all sound like pie in the sky, but the company is deadly serious. They have the financial muscle of Peter Thiel behind them, and they intend to hit the waters in the third fiscal quarter of 2013. A recent survey undertaken by Blueseed indicated that 133 start-ups have expressed a desire to move at least four people to the ship.